Attending a conference is often a large investment of both your time and money. You'll likely need several days away from work to travel to and from the conference as well as attend the conference itself. Then you'll pay for hotel, air fare, food, business cards, and perhaps clothes. If you make such a large investment, you'll want it to pay off. 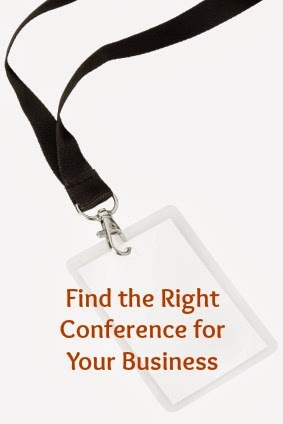 One excellent way to get the most from a conference is to make sure you attend the right conference. Let's say you're a freelance writer specializing in healthy eating and nutrition. You may initially think that the best conference to attend is a writing conference. True, writing conferences can be helpful. You can connect with your peers and learn new writing styles and strategies. You can learn to grow your business and tricks of the trade. But always attending writing conferences may not be the best way to go. You may find attending a food conference or holistic health conference equally effective, if not more so. While the writing conferences help you hone the skills of your craft, the food conference can help you connect with potential clients. In addition, you can learn about the trends in the industry as well as what interests and concerns your clients. Attending a conference that your clients attend is often the best secret to growing your business. This strategy can apply to whatever field you're in. If you're a wedding photography, sure, you'll want to attend photography conferences, but you'll also want to attend bridal shows to learn the latest trends, styles, and concerns. The perfect conference for you may change from year to year or season to season. Maybe one year you attend a professional conference that helps you hone your craft. Rather than continuing to attend the same kind of conferences, the next time you go to a conference, attend a trade one for the field you work in. You may be pleasantly surprised to watch how it helps your business grow. How do you decide what conferences to attend to benefit your business?